Our sukkah comes to life each fall, through the work of our TBT Brotherhood men, who build our community sukkah in the grassy quad. 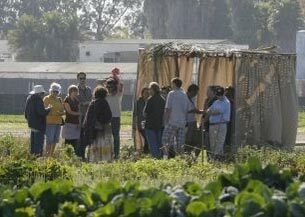 For a week, the sukkah is the site of pre-school picnics, Torah School classes, social gatherings, and fun activities. Sukkot always features a community dinner in the sukkah, and Shabbat morning services are always held outdoors in the sukkah. We shake the lulav to the east, south, west and north, up and down, and count the blessings that surround us. We inhale the fragrant etrog, and are grateful to God for the bountiful world we inhabit, as we remind ourselves of our obligation/mitzvah to care and tend for the fragile planet earth.